Edward Angelo Goodall was the eldest son of Edward Goodall, an engraver of JMW Turner’s works and brother of the artists Walter, Eliza and Frederick Goodall. He was apprenticed to his father as a line engraver but decided in his teens to become a painter. He was a regular exhibitor at the Royal Academy, first showing there in 1841. 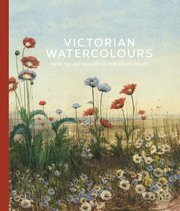 In 1858, he was elected an associate of the Society of Painters in Water Colours, and made a full member in 1864. In many ways Goodall represents the stereotypical image of the intrepid Victorian artist, travelling to destinations far beyond those to which British painters had traditionally been drawn. In 1841 he journeyed to British Guiana as official artist on a government-backed expedition to define the colony’s boundaries. His richly illustrated diary of the campaign became the subject of a book published in 1977, Sketches of Amerindian tribes 1841–1843 by MN Menezes. Then, in 1854–55, he acted as war correspondent for The Illustrated London News during the Crimean War, dispatching drawings from the battlefield for engravers in London to turn into images for mass publication. 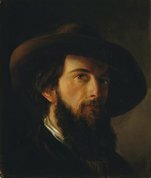 Goodall also painted in France, Italy, Spain, Portugal and Morocco. In 1870 he travelled to Egypt with his brother Frederick, inspired by the widespread fascination for that country. His interest in landscape, architecture and monuments rather than purely genre subjects is evident in the Gallery’s watercolours. The earlier of the two – Near the pyramid, Sakkara 1874, which depicts the ancient step pyramid and burial ground of Sakkara – originally had a much longer title, combining biblical allusion with a topical reference to the recent excavations of the French archaeologist, Auguste Mariette-Bey: ‘Son of Man, can these bones live? And I answered, O Lord God, thou knowest.’ Ezekiel, chap 37, verse 3. Near the Great Pyramid of Sakkara: Excavations at the Tombs, under the direction of Marretti [sic] Bey.